Last year on Valentine’s day, I wrote what has been one of my most popular posts of all time. I spoke of enduring love – the kind my grandparents demonstrated for me and that Nanci Griffith sings about and that I am thankful for each and every day of my marriage. Hannah, the Wayfaring Chocolatier recently introduced me to Reina DelCid and I thought it made the perfect valentine. Valentine’s Day pays homage to Saint Valentine, a Roman priest during the reign of Emperor Claudius II. As Claudius forbid his military to marry, St. Valentine carried out marriage ceremonies in secret. His actions and his refusal to abandon his faith caused his beheading on February 14th – a journey of love in the face of hardship and oppression and the reason for Valentine’s Day. What I love about this day and about this journey is that it acknowledges an enduring love that as difficult as it can be, is the same that we receive from our creator. How can you celebrate a favorite relationship all year long? It’s gotta be love if you’re serving Broccoli Stalk Soup on Valentine’s Day. Put potatoes, onion, carrots and lentils in a pan and cover with water. Bring to a boil and reduce heat to simmer for 10 minutes. Add the broccoli and fennel and cook until tender. Allow to cool a bit before pouring into a food processor and pureeing until smooth. Taste and season. Add sour cream or other fresh spices before serving. Great post, and neat song! I add my strong recommendation to yours for The King’s Speech. Every performance is spot on, brilliant. The movie is exquisitely written, and even though I knew the outcome of the film before I saw it, I was struck by how truly suspenseful the movie is! Geoffrey Rush is so wonderful, Colin Firth deeply sympathetic as King George VI, Helena Bonham Carter as Queen Liz (the Queen Mum) presents the other half of a wonderful marrige. I cannot get over how deeply touching and loving this film is. I loved the relationship between George and his daughters, the future QE II and Princess Margaret Rose. It is my understanding that QE II has seen the film and approves. Interestingly enough, the Queen Mum would not allow the film to be made when she was alive. The movie had been in the works for some years, and had been shelved until her death. The movie presents such a loving picture of the Royal family (except for Edward VIII, Mrs. Simpson, and George V), but I guess she felt it was too personal. Happy Valentine’s Day, Tammy! Hope it was great! Thank you Paula. I actually think that Edward and Wallace Simpson have an amazing love story but am certain that it was too personal for the Queen Mother. I fixed the recipe too. BTW, the recipe says to add fennel, but there is none in the ingredient list. How much? Love the song. How perfect for a lover of words. Love it too Nancy and I fixed the recipe. Oh, I’m so happy you’re sharing that song with your readers too! I’m listening to it again as I type this 🙂 I, too, adored The King’s Speech. The love and support showcased not just between King George and his wife but KG and Lionel was so heart-warming. Thanks Hannah and thank you for sharing Reina with me. Love her. Wow, I have to get on watching these movies (I’m so behind it seems)! I like the origin of Valentine’s Day, but in general dislike the consumerism it evolved into these days – most people would buy anything that’s heart shaped or even just red for that matter. Yes, I didn’t mention it but we aren’t big into gift giving in my house. Secondly, both are great movies. I was also so touched by the relationship portrayed in Julia and Julia (which is really not just a chick-flick. Many guys – and cooks- that I know really loved that movie). And we just saw Kings Speech a couple weeks ago at our local indy County Theatre. Good stuff today, and hope you had a swell Valentine’s Day! Trouble in the Fields is one of my all time favorites. And yes, I am a folky at heart and toes. Thank you Cindy. Hope your day was sweet. Fab, Tammy: I still haven’t seen the king’s speech and must get to it soon. The soup looks wonderful. We really did eat the soup for V-Day and it was great. The fennel seeds give it a great bite. Tammy, love your post and the song. Thanks for sharing! I agree with the thought that Valentine’s Day is, like most well meaning holidays, too commercialized. Also too much pressure is put on those without someone special, be it a spouse, significant other, child, friend, etc. As long as we have a deep faith and belief in our Lord we need to remind ourselves, He is the best and only Valentine we need. Loved Julie and Julia, will have to watch The King’s Speech with my everyday Valentine sometime soon! You know how someone did an edit of The Phantom Menace and edited out Jar-Jar Binks? I wish someone would do that with Julia and Julie and edit out the Julie parts. If you’d told me there was a good biopic in the life story of Julia Childs, I wouldn’t have believed you, but, holy cow, what an amazing story. The King’s Speech is definitely on my list, but with kids, I’m thinking I might have to wait until it’s out on DVD. It’s worth waiting for but definitely a must see! and I had no idea that someone edited out the Jar-Jar Binks. 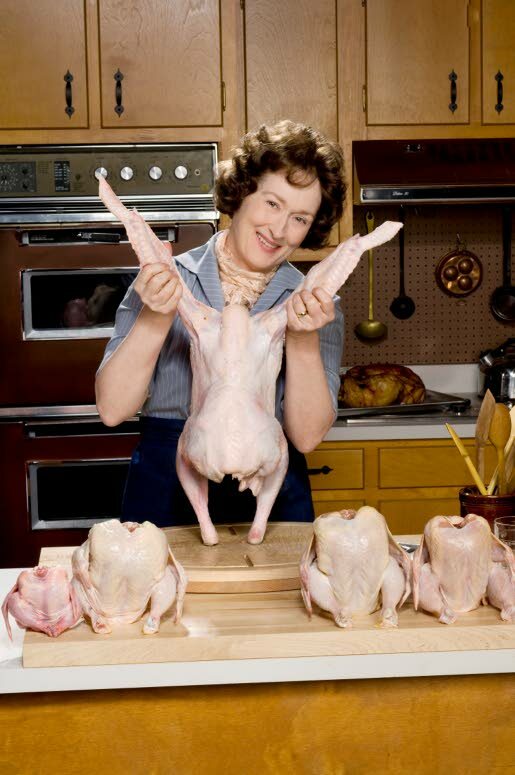 I also have seen the film: Julie & Julia. But my mom & I wanted mre from thefilm. It was okey but not anything more,…I have the film on DVD. This soup sounds delicious though! I know that a lot of people were annoyed by the Julie role but I thought Meryl Streep did a fabulous job and I didn’t know that much about Julia before watching it. Loved both films, Tammy. How wonderful that you claim a love that shares an appreciation for the simple, healthy, tasty, and home made. He might look to differ on the word “appreciation” but he eats it just the same. Lovely post, Tammy…your soup sounds delicious! Second your movie recommendations they are both brilliant. I love the sound of your soup and really enjoy eating broccoli stems. I often add them to stir fries and people love to eat them but until I tell them have no idea that its broccoli. Your soup sounds delicious and I cannot wait to make it. Thanks for the history on V-day. I’m sure I’ve heard it before, but never really remembered it. An excellent premise for the day, and if only it would retain that type of focus instead of the Hallmark variety. But that is much like most holidays these days. I’m thinking I’m an oddball though…. for Valentine’s we went to see Blue Valentine. The theatre was nearly empty (surprise) but I enjoyed the movie as it was REAL. Relationships aren’t pretty all the time but can hit rock bottom – sometimes rebounding, and sometimes not. And re: Julie and Julia…. I actually liked Julie (have heard of many that didn’t) and found Julia more annoying. It was mostly her mannerisms and the way she talked which bothered me, not sure why…. Glad you liked the V-day stuff. I have also heard a great number of people not liking Julie but she didn’t bother me. I loved the movie “Julie and Julia!” After watching it I made a plan to make so many recipes in a year too, but unfortunately I didn’t end up doing it. I do want to bake/cook some more though and try new recipes. Don’t be hard on yourself about not doing it. Progress is about incremental change. Streep did a wonderful job playing the French Chef – should have won some kind of award. My grandparents knew Julia and Paul and the movie does a wonderful job of illustrating their love story. It was just so in real life, at least according to my grandparents. They’re one of my favorite couples. How cool is it that they were friends of your grandparents? That’s great. I did see Julie and Julia and got blown over by it. Especially Meryl Streep. She is no actress like any other actress; she is beyond. did you see, “Bridge over Madison County” ? If you havent, please. Since I’m a lifestyle blah person, I digged her retro kitchen. I wanted to comment on your “About me” Page about the lessons on life from the kitchen. It is such a wonderful thing. I did learn a lot there too; and a wee bit from Cricket (the sport). I don’t play, obviously, Im a very lazy girl, but my father did. I’ve had the most valuable lessons in my life with my mum & granma in the kitchen and in my dad’s study with dad. That’s where I intend to pass them on to my children. It will be great to have you here! I had no idea that Valentines Day originated from this event. I loved Julie and Julia so I will have to try The Kings Speech.